With more than 30 years of experience in Leading Organizational Transformations, Executive Coaching, Leadership Transformation, Training & mentoring people on Project, Program & Portfolio Management, Agile Practices including Scaled Agile (SAFe) across diverse industries covering range of audiences including senior leadership, management, Business & Technology Domains (Development & Operations), HR, Finance, Sales and various functional teams. Having spent almost 23 Years in Indian Air Force (IAF), he is a proud service veteran and an United Nations Peace Keeper who spent a full year representing India at Democratic Republic of Congo. 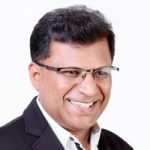 He has successfully lead significant transformation programs for organizations like IAF, General Motors, ANZ Bank and Societe Generale covering Digital Transformation, Operational Process Transformation, Payments Transformation, Agile, DevOps & Cloud Transformations. He has coached Senior Executives, also facilitated senior level executive briefings, webinars, online events and has spoken at multiple conferences with excellent results. He is also a volunteer for career coaching through LinkedIn and was also a solution reviewer as part of Smart India Hackathon, a Government of India initiative.